Sign up for Broadjam today to follow Kelli Grant, the Queen of Swing, and be notified when they upload new stuff or update their news! The Queen of Swing, Swings with her new CD, "Swing-a-Billy" which has already received 4 stars with French critic exclaiming "superb." The Queen of Swing, Swings with her new CD, "Swing-a-Billy" which has already received 4 stars with French critic exclaiming "superb." Kelli received notice that the Grammy Reviewing Board placed 4 songs in contention for the 2013 Grammy Awards, Best Pop Vocal Performance. (not nominated). The CD kicks off "swinging" with the title cut, an autobiography of her musical career. 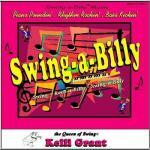 With original lyrics, 4 verses long (included) Kelli gives praise to her Mother's influence and gift of a signature piano style, "Swing-a-Billy". Kelli plays a walking 4/4 "swing" bass line with her left hand, a testament to her title, "the Queen of Swing" given to her by Mr. Action, Roy Moss & Carl "Blue Suede Shoes" Perkins. However; the fun has just begun as a charismatic Swing version of "Goody, Goody" starts the ball rolling rivaling "The King of Swing" Benny Goodman's hit and Frankie Lymon's 50's chart topper. No disappoints so far as the Swing Queen ascends you to the CD's magnificent original, and Kelli's signature song, "The Queen of Swing". If your foot is not tapping by now friends and neighbors, then call the family in cause you must be "DEAD." ;o) With a couple of R&B covers by musical legends, "The Drifters" and R&B megastar, Ray Charles; "Drip Drop" & "Hallelujah, I Love Him So" Kelli takes you to another groove on an even higher level. Which I didn't think was possible. Complimenting Ray Charles cover with the exact opposite meaning, Kelli wrote a very enjoyable R&B story song that could truly catapult the CD into a Platinum arena. "Don't Mess With Me" (side note: Kelli wrote / recorded "Don't Mess With Texas" for the state of Texas, thus the song/title). With a "Zing" in my heart I enjoyed the vocals of this amazing singer on the Judy Garland cover, "Zing, Went the Strings of my Heart". A rather strange but mesmerizing arrangement I found captivating as well as exciting. Grab your girdle's girls and strut your stuff to two more of Kelli's penned genius: "
I have been recognized in Western Swing; Will Rogers Award - Female Artist of the Year; Wrote & Recorded "Don't Mess With Texas" for the Texas Department of Transportation ... BUT I also won an "Honorable Mention" from Billboard in R&B for a song I wrote and recorded. Swing-a-Billy was written to establish my own piano style. I headlined and then recorded (piano/left hand bass)with Rock-a-Billy artist "Mr. Action" Roy Moss 40 years after his Mercury days and he tagged me "The Queen of Swing". A few years later I headlined with Carl Perkins at a Wink Festival for the late Roy Orbison and he agreed. Both men were products of the Swingin' 50's and Rock-a-Billy's beginning. I felt like this was my own creation due to my Mom teaching me to walk the chord in my left hand when I was about 7 because I could not reach the 10th she was playing. It has become my signature style. The same titled CD has received 4 STARS from French critic and has been featured in several European magazines. The song is about The Queen of Swing & her Band of Five performing at a juke joint set in the late 40's or early 50's. This is a fun song hoping everyone will dance, swing and rock the night as they listen to the BAND OF FIVE and The Queen of Swing. So grab a partner and let her fly. Just, Spin & Spin, run away with him. Dance too close & it's just alittle sin. the band of five & the Queen of Swing. A dance song that tells a story of a boy and girl learning the dance steps that lead to the steps of love. When I was a kid, I wanted to learn to play a Boogie Woogie but my piano teacher would not allow me to play anything but classical music. So, I finally wrote my own Boogie Woogie. To do the Boogie Woogie Stroll. Although the song seems to be a little demonstrative in declaration it was really written or suppose to be a funny take on a couple that consistently fights but seems to always makes up. But not matter how much she loves him her heart gets broken every time he stays. Having enough but still in love she is threatening him emphatically to just go away and leave her alone or ... "Don't Mess With Me"
You said you didn't want to ever see me no more. You say you love me, you're never gonna do it again.